Used Weiand tunnel ram #5994 for 351C. Tunnel ram top was originally for 4150 carbs, but has been modified to mount 4500 Dominator carbs sideways (but with a couple of degrees rotation off square). It also comes with adapter plates I made to adapt the top back to 4150 carbs facing forward or sideways. Front of tunnel ram has been heavily clearanced for a Mallory Super Mag II. Top-to-base runner area has some very slight cleanup work done with a sanding drum. Sale includes the TR top, TR base, two 4150 adapter plates, & 8 top-to-base studs. No gaskets, & no other mounting hardware/fasteners included. They are $488-489 new from Jegs/Summit. 2 used copper head gaskets for 351C, 351M, & 400 (used once). These used copper head gaskets can be reused by flipping them over so your block's O-rings imprint on the unused sides of the copper surface. Stainless Steel O-ring wire not included. Moroso tall chrome valve covers for Boss 302, 351C, 351M, & 400. These are the classic hard to find Moroso tall chrome plated steel valve covers for the Boss 302, 351C, 351M, & 400 used to clear stud girdles. They have a couple of dents & scratches from use but still look pretty good for their age. They also have some minor surface rust on the gasket flanges from sitting on the shelf. Sale includes the valve covers only, no gaskets, no mounting hardware, & no breathers included. $95.00 + shipping. Pro Stock Engineering 351C main cap strap kit for 2 or 4 bolt main caps, pn # 1901-351C (new/never run). Kit includes 3 straps (.7400" x 1.050") for the center 3 main caps + studs, nuts, & washers for the inner fasteners + Allen head bolts, & washers for the outer fasteners. Kit can be used with both factory 4 bolt caps & factory 2 bolt caps on a 351 Cleveland. The crowns of the 3 center main caps will need to be machined flat/even with their bolt spot-face surfaces for the straps to fit flush against the main caps. Milodon Gear Drive set for 351C, 351M, & 400 pn #14200 (new/never run). This Milodon Gear Drive set has never been run, it was only initially mocked-up on a block. The cam gear, idler gear, & mounting bracket all fit correctly. But the crank gear might/might not be the correct one for this application because it has a machined recess in the crank gear face, (maybe it's the wrong gear, maybe it needs a spacer, I'm not 100% sure either way). It's also missing one Allen Head mounting bolt, (has 3 of 4 bolts) and has some surface rust from sitting on the shelf. New they are $420 to $450 from Summit/Jegs. 2 Crane Gold 1.73 roller rockers for Boss 302, 351C, 351M, 400, 429, & 460. Old Crane pn # 27-1.73 (new/never run). I bought these 2 Crane Gold rockers new to use as spares on my 351C stuff, they never saw any use. 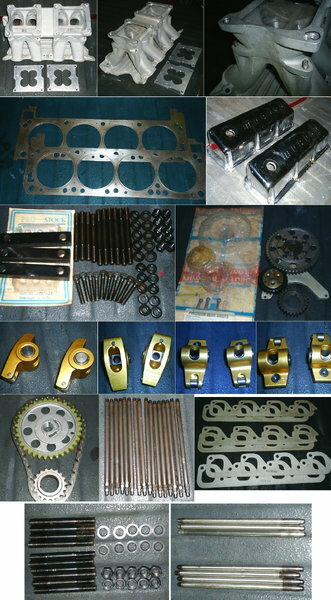 2 OEM style timing chain sets for 351C, 351M, & 400 (new/never run). These timing chain sets are factory/OEM style with a steel crank gear, aluminum cam gear with plastic/nylon teeth, and a link-belt chain. Set of 16 3/8 adjustable pushrods for 351C (used). I'm not 100% sure but I think they might be ISKY pushrods, but I don't remember. $110.00 + shipping. header gaskets for boss 302 & 351C 4V heads (never used). 3 sets (6) header gaskets for boss 302 & 351C 4V heads (pn # 85343). They are old and kinda dry, but a coating of anti-seize should wake them up again. One of the gaskets has been opened up to a ported 4V port size, but the other 5 are untouched. $10.00 each set + shipping, or $25.00 + shipping for all 3 sets. ARP 351C 2 bolt main stud kit (used). Sale includes 10 studs, 10 washers, & 10 nuts. Partial set of 7 Manley 3/8 pushrods pn # 25752 for 351C (used/spares). Old used/spares set, 4 newer & 3 older. $25.00 + shipping. Cash, money order, and Pop Money (popmoney.com) accepted. Sorry no PayPal. Shipping is from Kennedale TX. Any questions private message or email me [email protected] I usually check the forums & emails only once a day, so my response time to questions might not be very fast. Cash, money order, and Pop Money (popmoney.com) accepted. Sorry no PayPall. Shipping is from Kennedale TX.